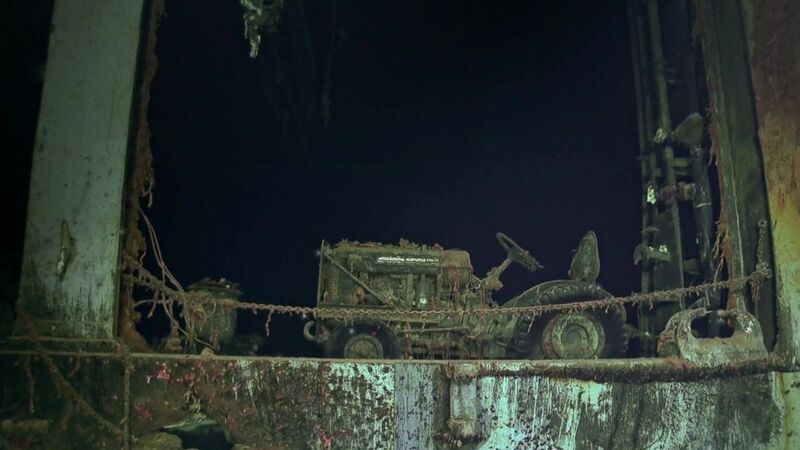 Deep in the South Pacific Ocean, researchers have located the final resting place of the USS Hornet, the World War II aircraft carrier sunk in a 1942 battle with the Japanese Navy. 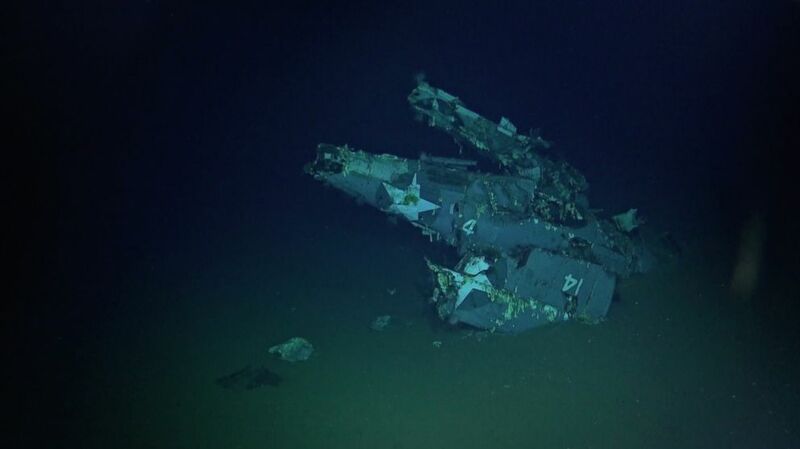 Overhead sonar images show the carrier lying eerily upright and nearly intact on the deep and desolate ocean floor. 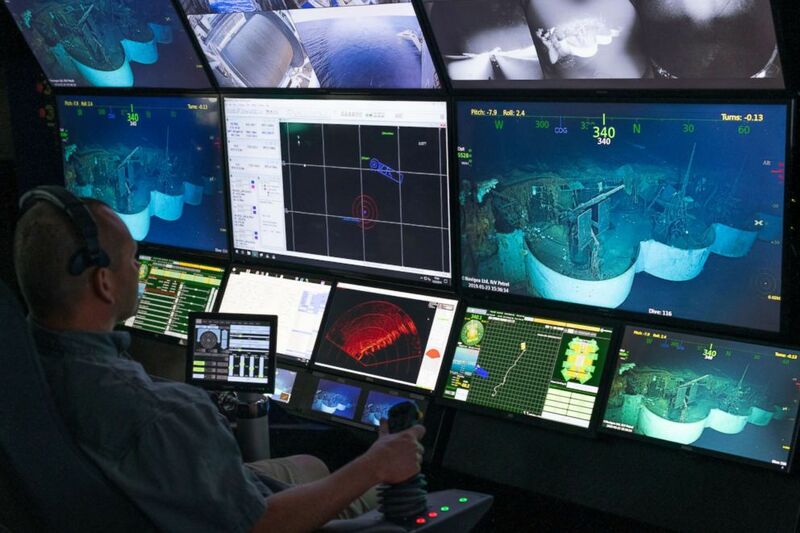 The aircraft carrier was located in late January by the research vessel R/V Petrel in waters nearly 17,500 feet deep around the Solomon Islands. Because of the ocean depth where it was located, the entire ship shows little sign of deterioration or buildup from ocean life. 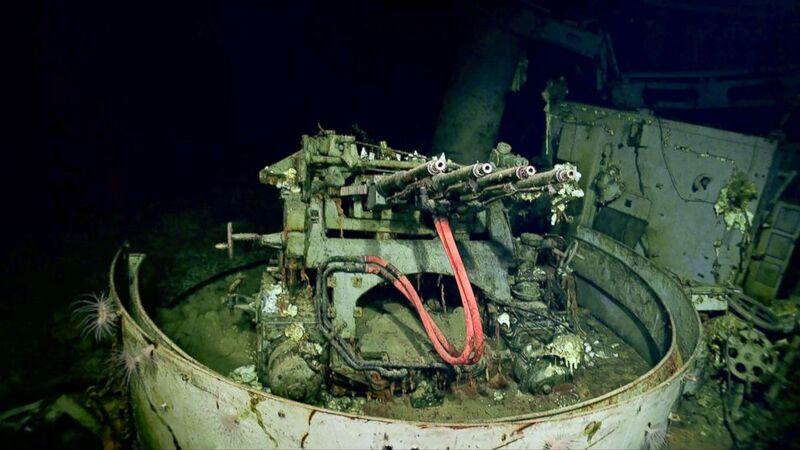 (Courtesy Paul G. Allen's Vulcan Inc.) A 1.1 inch anti-aircraft gun sits on the remains of the USS Hornet. Close-up underwater images capture the moment in time shortly after the carrier sank the night of Oct. 26, 1942, during the two-day Battle of Santa Cruz Island. (Courtesy Paul G. Allen's Vulcan Inc.) An international harvester aircraft tug sits on the sunken aircraft carrier USS Hornet. One image shows an aircraft tug with its black rubber tires still gripping the carrier’s deck where it would have moved aircraft into position. A sign with the tug's maker, "International Harvester," is clearly visible atop its engine. (Courtesy Paul G. Allen's Vulcan Inc.) An F4F-4 Wildcat fighter aircraft with its wings folded sits on the ocean floor. Also visible are the anti-aircraft weapons used to fend off the intense bombardment from Japanese aircraft. In the end, the resulting fires and damage to the ship from the bombs dropped by Japanese planes were too much and the Hornet’s 2,000-strong crew was forced to abandon ship. After U.S. Navy ships tried without success to scuttle the ship, the carrier was finally sunk by four torpedoes fired by two Japanese destroyers. 111 sailors from the Hornet’s crew lost their lives in the battle. (Courtesy Paul G. Allen's Vulcan Inc.) A member of the team views pictures of the remains of the USS Hornet inside the online room of the R/V Petrel. The carrier was best known for its role in the famous Doolittle Raid in April 1942, when 16 B-25 bombers took off from the ship’s deck for a surprise bombing raid on Tokyo. Later that summer, the ship participated in the Battle of Midway, the pivotal aircraft carrier battle that turned the tide of the war in the Pacific. (Courtesy Paul G. Allen's Vulcan Inc.) The AUV Hydroid Remus 6000 is deployed from the R/V Petrel. The autonomous underwater vehicle is capable of operations in up to 6,000 meters of water. The research team aboard the R/V Petrel used information deck logs and action reports from American and Japanese ships involved in the Battle of Santa Cruz to get a general fix for where the ship’s wreckage might be. 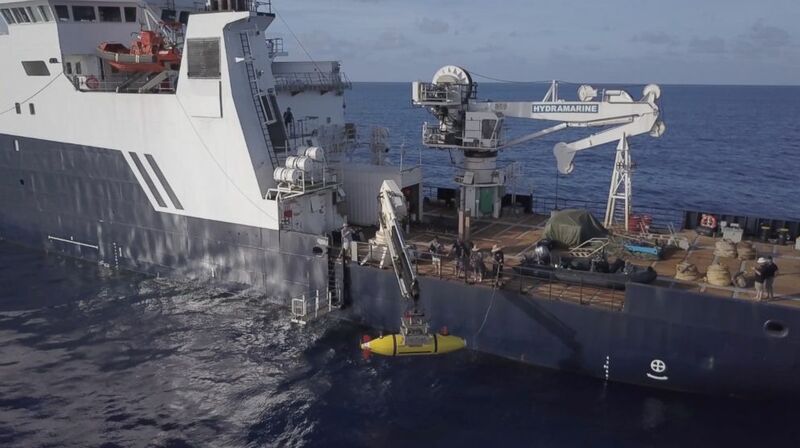 The researchers did such a good job that they found it on their first dive of the Petrel’s autonomous underwater vehicle. The 250 foot Petrel research vessel carries out underwater exploration in search of historic World War II wrecks. The ship and its expedition crew are fully-funded by the estate of the late Paul Allen, one of the founders of Microsoft. Admiral Bill Moran, the vice Chief of Naval Operations, praised the discovery of the historic ship, noting that today's sailors "draw inspiration from the fighting spirit of ships and crews like USS Hornet (CV 8)." "Although her service was short-lived, it was meteoric," he added. "As America's Navy once again takes to the sea in an uncertain world, Hornet's discovery offers the American Sailor a timeless reminder of what courage, grit, and commitment truly look like. We'd be wise as a nation to take a long, hard look. I'd also like to thank the crew of Petrel for their dedication in finding and honoring her sacrifice." Editors Note: This story has been updated to reflect that the USS Hornet sank in 1942, not 1943 as originally stated in a Vulcan Inc. press release.